Earnie Carson Phillips, 70, of Waynesburg, Kentucky, passed away Monday, November 19, 2018. Born Sunday, May 9, 1948 in Hazard, Kentucky, he was the son of the late Willie and Hazel Campbell Phillips. His loving wife, whom he married April 19, 1973, is Vicky Burton Phillips of Waynesburg. Earnie worked as an insurance agent and was a railroad contractor for many years. He was a member of Parlor Grove Baptist Church, a Mason and a member of the Double Springs Cemetery Board. 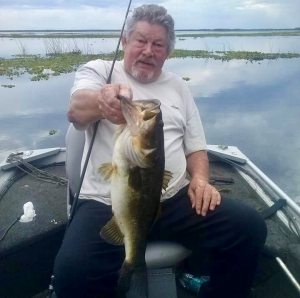 He enjoyed Bass Fishing and hunting in his spare time. In addition to his wife, Earnie leaves behind two sons, Christopher Lee Phillips (Vicki) of Colorado Springs, Colorado and Ethan C. Phillips of Somerset, Kentucky; and two grandchildren, Meghan and Matt Phillips both of Colorado Springs. In addition to his parents, Earnie was preceded in death by two brothers, Billy and David Phillips; and four sisters, Jenny Montgomery, Edna Houchins, Francis “Della” McCullough and Velva Lamb. A Funeral Service will be held 1:00PM Saturday, November 24, 2018 at Barnett, Demrow & Friend Funeral Homes with Bro. David Gambrel and Bro. David Conrades officiating the service. Burial will follow in Double Springs Cemetery. Lee Burton, Chris Phillips, Matt Phillips, Randy Adams, Ethan Phillips, and Randy Phillips will serve as Active Pallbearers. Jerry Pierce and Jackie Haggard will serve as Honorary Pallbearers. Visitations will be held 5-8PM Friday, November 23, 2018 and 11AM-1PM Saturday at the Funeral Home. Memorial Contributions suggested to Double Springs Cemetery Fund, PO Box 56, Waynesburg, KY 40489.